Living in Dubai for the past six years has naturally introduced me to Middle Eastern foods. If there is one thing that I really like about their cuisine, it's their use of green leafy vegetables and herbs. Nowhere else I have seen parsley, cilantro, mint being sold in such huge bulks. And there is still lots for me to learn. I haven't even tried half of the fresh herbs on the supermarket shelf. One of the reasons is that it is sometimes hard to find out what it actually is. The shop assistants would only know the Arab name of it. However, I found out about purslane. Purslane is actually a weed, but a very nutritious one. It is very high in vitamin A and C and iron. Its taste is something between nutty and lemony,similar to the one of spinach. Apparently it grows very quickly, 3-4 weeks after sowing the seeds you can harvest purslane leaves. Purslane is a perfect ingredient for summer salads. We are on holiday at Germany's North Sea coast right now. Fresh fish is available right at our doorstep. The weather is beautiful and we have a BBQ grill in the garden. No doubt I will stuff myself with fresh grilled fish for the next couple of weeks. On such occasions, I don't like to distract from the fish with fancy and filling potato, rice or pasta salads. 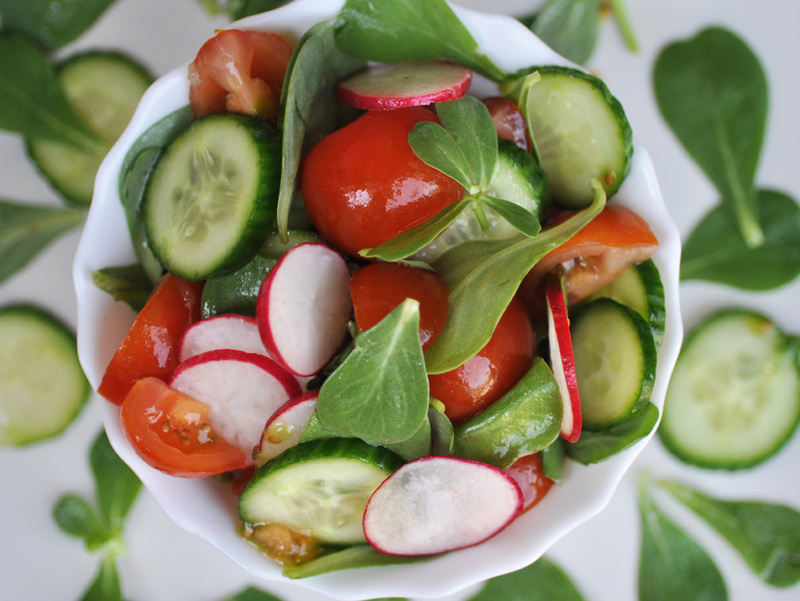 A simple salad with tomatoes, cucumbers, radishes and purslane just fits the bill. You can't go wrong with something light and fresh in summer. Combined with grilled fish it will be a perfectly healthy and utterly delicious meal. Slice the cucumbers and radishes. Pick the leaves from the purslane stems. Cut the cherry tomatoes into quarters. Combine all vegetables in a salad bowl. Mix all ingredients for the dressing. Pour over the salad and mix.